QUAKER. 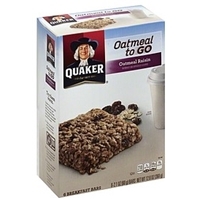 OATMEAL TO GO. OATMEAL RAISIN. NATURAL & ARTIFICIAL FLAVORS. 3G OF OAT SOLUBLE FIBER DAILY AS PART OF A DIET LOW IN SATURATED FAT AND CHOLESTEROL MAY REDUCE THE RISK OF HEART DISEASE. EACH BAR PROVIDES 1G. * ALL THE NUTRITION OF A BOWL OF INSTANT OATMEAL! 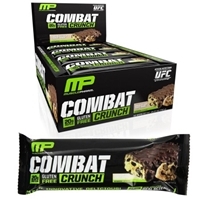 6 - 2.1 OZ (60 G) BREAKFAST BARS. NET WT 12.6 OZ (360 G). 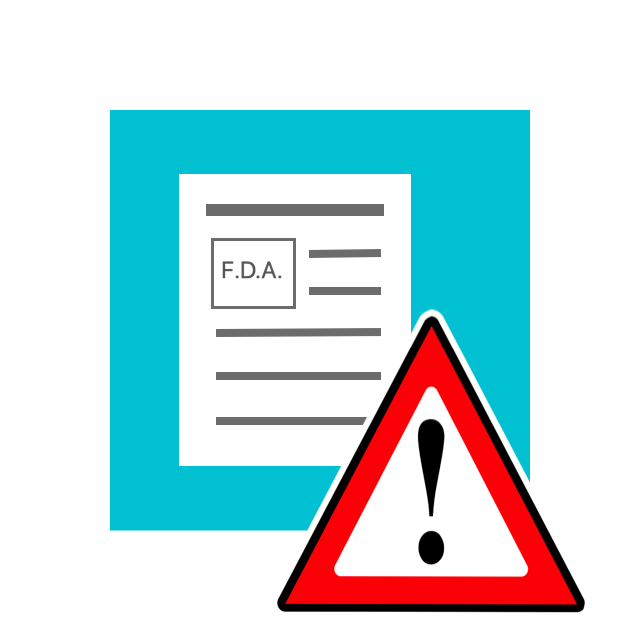 Whole grain rolled oats, high fructose corn syrup, raisins, brown sugar, oat flour, oat bran concentrate, rice flour, margarine (partially hydrogenated soybean oil, soybean oil, water, partially hydrogenated cottonseed oil, salt, mono and diglycerides, soy lecithin, calcium disodium edta [a preservative], annatto color, artificial flavor, vitamin a palmitate), polydextrose, modified food starch, glycerin, sugar, corn syrup, calcium carbonate, natural and artificial flavor, malted barley extract, salt, sorbitol, cinnamon, sodium bicarbonate, malted barley flour, corn flour, sodium alginate, malic acid, tocopherols, tricalcium phosphate, spice, niacinamide (one of the b vitamins), potassium sorbate (preservative), reduced iron, trisodium phosphate, vitamin a palmitate, pyridoxine hydrochloride (one of the b vitamins), riboflavin (one of the b vitamins), thiamin mononitrate (one of the b vitamins), bht (preservative), folic acid (one of the b vitamins).contains soy ingredients. May contain traces of peanut and tree nuts. Roasted peanuts, soy protein isolate, chicory root extract, sugar, vegetable oils (palm kernel oil, high oleic canola oil, peanut oil), whey protein concentrate, tapioca syrup, corn syrup, less than 2% of: rice starch, roasted sunflower seeds (sunflower seeds, cottonseed oil and/or sunflower oil), glycerin, cocoa powder (processed with alkali), toasted coconut, calcium carbonate, salt, water, cocoa powder, nonfat dry milk, fructose, soy lecithin, xanthan gum, natural flavors, mixed tocopherols (antioxidant), baking soda.contains: peanut, almond, soy, milk, coconut. 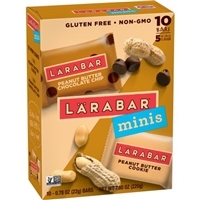 Brand/Manufacturer: Larabar General Mills, Inc.
Peanut Butter Chocolate Chip: Dates, Peanuts, Semisweet Chocolate Chips* (Unsweetened Chocolate, Sugar, Cocoa Butter, Vanilla), Sea Salt. *Fair Trade Certified(tm) by Fair Trade USA. Peanut Butter Cookie: Dates, Peanuts, Sea Salt. 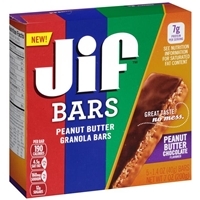 Brand/Manufacturer: Jif J.M. Smucker Co. Rolled oats, sugar, corn syrup, palm and palm kernel oils, whey protein isolate, isolated soy protein, partially defatted peanut flour, peanut butter and chocolate flavored spread (peanut butter [made from roasted peanuts and sugar, contains 2% or less of: molasses, fully hydrogenated vegetable oils (rapeseed and soybean), mono and diglycerides, salt], chocolate flavored spread [sugar, peanut oil, cocoa processed with alkali, contains 2% or less of: corn starch, polyglycerol esters of fatty acids, natural and artificial flavor], fully hydrogenated vegetable oils [rapeseed and soybean]), glycerin, milled corn, corn syrup solids, natural flavor, honey, cocoa processed with alkali, fructose, salt, calcium carbonate, fruit juice concentrate (pear or apple), water, soy lecithin, reduced mineral whey powder, canola oil, skim milk, molasses, salted butter (cream, salt), sodium citrate, fruit and vegetable extract for color, tocopherols (antioxidant).contains milk, peanut and soybean ingredients. May contain tree nuts and wheat ingredients. Contains honey. Do not feed to infants under one year. 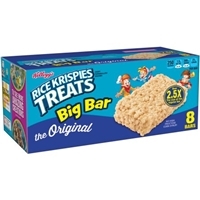 Brand/Manufacturer: RICE KRISPIES TREATS Kellog Co.
TOASTED RICE CEREAL (RICE, SUGAR, SALT, MALT FLAVORING, NIACINAMIDE, REDUCED IRON, RIBOFLAVIN [VITAMIN B2], FOLIC ACID), MARSHMALLOW (CORN SYRUP, SUGAR, GELATIN, NATURAL AND ARTIFICIAL FLAVOR), FRUCTOSE, MARGARINE (VEGETABLE OIL [SOYBEAN AND PALM OIL WITH TBHQ FOR FRESHNESS], WATER, NATURAL AND ARTIFICIAL BUTTER FLAVOR [CONTAINS MILK], DATEM, ACETYLATED MONOGLYCERIDES, BHT FOR FRESHNESS, VITAMIN A PALMITATE, VITAMIN D), CORN SYRUP SOLIDS, CONTAINS TWO PERCENT OR LESS OF DEXTROSE, GLYCERIN, SALT, NIACINAMIDE, PYRIDOXINE HYDROCHLORIDE (VITAMIN B6), THIAMIN HYDROCHLORIDE (VITAMIN B1), RIBOFLAVIN (VITAMIN B2), SOY LECITHIN. 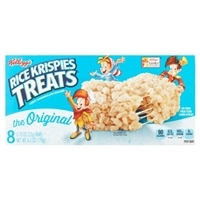 Brand/Manufacturer: Rice Krispies Kellog Co. PROTEIN BLEND (WHEY PROTEIN ISOLATE, MILK PROTEIN ISOLATE), ISOMALTO-OLIGOSACCHARIDE (PREBIOTIC FIBER), CHOCOLATE CHUNKS (CHOCOLATE LIQUOR [PROCESSED WITH ALKALI], SUGAR, COCOA BUTTER AND VANILLA), GLYCERIN, VEGETABLE OILS (PALM, PALM KERNEL OIL), SUGAR, ALMONDS, WATER, SOY PROTEIN ISOLATE, MALTITOL, AND COCOA (PROCESSED WITH ALKALI). 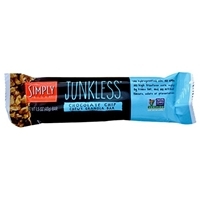 CONTAINS LESS THAN 2% OF: RESISTANT MALTODEXTRIN, SALT, SOY LECITHIN, NATURAL FLAVOR, SUCRALOSE, VANILLA, AND TAPIOCA STARCH. 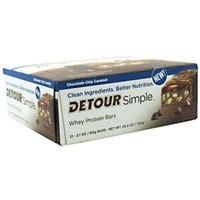 Detour Whey Protein Blend [Whey Protein Concentrate, Calcium Caseinate], Glycerin, Milk Chocolate Flavored Coating [Sugar, Palm Kernel Oil, Inulin, Whole Milk Powder, Cocoa Processed with Alkali, Non-GMO Soy Lecithin (An Emulsifier), Vanilla], Non-GMO Soy Protein Isolate, Caramel [Soluble Fiber, Inulin, Water, Fractionated Palm Kernel Oil, Butter, Non Fat Dry Milk, Sunflower Lecithin, Salt, Natural Flavor, Stevia], Gelatin, Water, Milk Chocolate Chips [Sugar, Cocoa Butter, Chocolate Liquor, Milk, Non-GMO Soy Lecithin, Natural Flavor], Non-GMO Soy Protein Crisps [Soy Protein Isolate, Rice Flour], Natural Flavors, Cocoa processed with Alkali, Salt, Stevia. 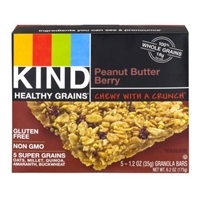 Whole Grain Blend (Oats, Millet, Brown Rice, Buckwheat, Amaranth, Quinoa, Oat Flour), Dried Cane Syrup, Honey, Tapioca Syrup, Cranberries, Peanut Butter, Canola Oil, Peanuts, Brown Rice Syrup, Raspberries, Gum Acacia, Vanilla Extract, Sea Salt, Peanut Flour, Vitamin E (to maintain freshness). 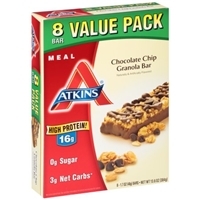 Brand/Manufacturer: Atkins Atkins Nutritionals, Inc. 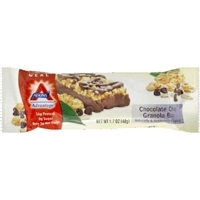 PROTEIN BLEND (SOY PROTEIN ISOLATE, WHEY PROTEIN CONCENTRATE, MILK PROTEIN ISOLATE), GLYCERIN, POLYDEXTROSE, PALM KERNEL OIL, CHOCOLATE FLAVORED CHIPS [MALTITOL, CHOCOLATE LIQUOR (PROCESSED WITH ALKALI), COCOA BUTTER, SOY LECITHIN, VANILLA EXTRACT], HYDROLYZED GELATIN, WHOLE GRAIN ROLLED OATS, MALTITOL, SUNFLOWER OIL, ROASTED ALMONDS, CELLULOSE, COCOA POWDER (PROCESSED WITH ALKALI), CALCIUM CARBONATE, NATURAL AND ARTIFICIAL FLAVORS, SOY LECITHIN, VITAMIN MINERAL MIX [DICALCIUM PHOSPHATE, MAGNESIUM OXIDE, ASCORBIC ACID (VITAMIN C), SODIUM ASCORBATE, VITAMIN E ACETATE, NIACINAMIDE, ZINC OXIDE, D-CALCIUM PANTOTHENATE, PYRIDOXINE HYDROCHLORIDE (VITAMIN B6), THIAMIN MONONITRATE (VITAMIN B1), RIBOFLAVIN (VITAMIN B2), VITAMIN A PALMITATE, FOLIC ACID, BIOTIN, CHROMIUM AMINO ACID CHELATE, SODIUM SELENITE, PHYLLOQUINONE (VITAMIN K1), CYANOCOBALAMIN (VITAMIN B12)], SALT, WHOLE MILK POWDER, SUCRALOSE, ACESULFAME POTASSIUM. 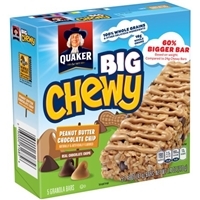 Granola (whole grain rolled oats, brown sugar, crisp rice [rice flour, sugar, salt, malted barley extract], whole grain rolled wheat, soybean oil, whole wheat flour, sodium bicarbonate, soy lecithin, caramel color, nonfat dry milk), corn syrup, brown rice crisp (whole grain brown rice, sugar, malted barley flour, salt), peanut butter spread (peanuts, sugar, palm oil, salt), semisweet chocolate chips (sugar, chocolate liquor, cocoa butter, soy lecithin, vanilla extract), invert sugar, peanut flavored chips (sugar, palm kernel and palm oil, partially defatted peanut flour, lactose, whey, dextrose, corn syrup solids, soy lecithin, salt, vanillin [artificial flavor]), corn syrup solids, sugar, glycerin. 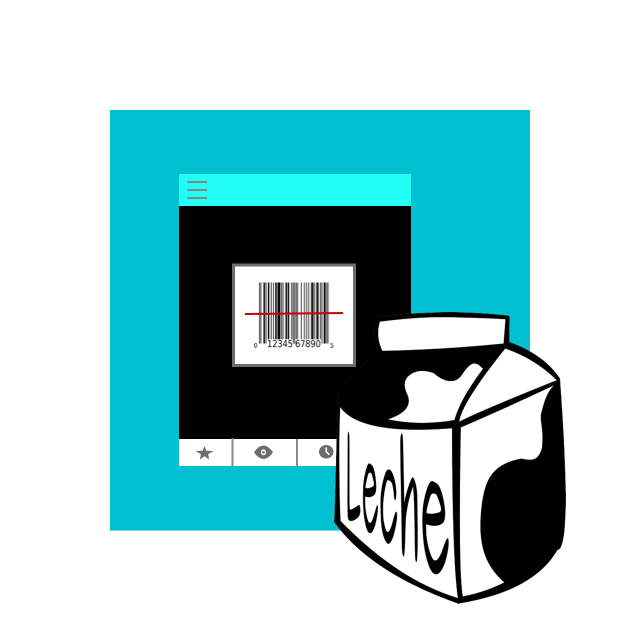 Contains 2% or less of palm kernel and palm oil, calcium carbonate, sorbitol, partially defatted peanut flour, salt, lactose, whey, dextrose, water, soy lecithin, natural and artificial flavor, bht (preservative), citric acid.contains wheat, soy, peanut and milk ingredients. May contain traces of tree nuts. 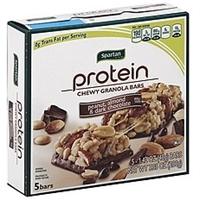 Protein blend (soy protein isolate, whey protein concentrate, milk protein isolate), glycerin, polydextrose, palm kernel oil, chocolate flavored chips [maltitol, chocolate liquor (processed with alkali), cocoa butter, soy lecithin, vanilla extract], hydrolyzed gelatin, whole grain rolled oats, maltitol, sunflower oil, roasted almonds, cellulose, cocoa powder (processed with alkali), calcium carbonate, natural and artificial flavors, soy lecithin, vitamin mineral mix [dicalcium phosphate, magnesium oxide, ascorbic acid (vitamin c), sodium ascorbate, vitamin e acetate, niacinamide, zinc oxide, d-calcium pantothenate, pyridoxine hydrochloride (vitamin b6), thiamin mononitrate (vitamin b1), riboflavin (vitamin b2), vitamin a palmitate, folic acid, biotin, chromium amino acid chelate, sodium selenite, phylloquinone (vitamin k1), cyanocobalamin (vitamin b12)], salt, whole milk powder, sucralose, acesulfame potassium.contains soy, milk, almonds and wheat. 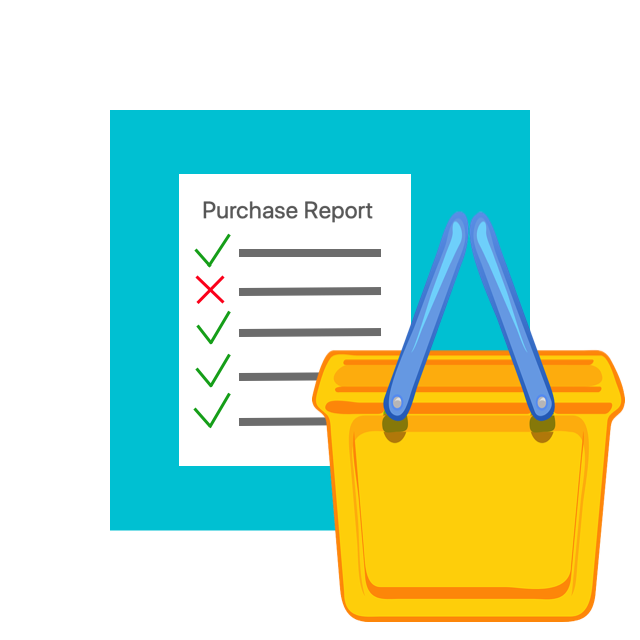 This product is manufactured in a facility that uses peanuts, other nuts and seeds. 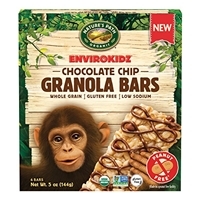 Brand/Manufacturer: Envirokidz Nature's Path Foods, Inc.
Granola* (Gluten Free Whole Grain Oats*, Cane Sugar*, Sunflower Oil*), Tapioca Syrup*, Brown Rice Flour*, Fair Trade Milk Chocolate Chips* (Cane Sugar*, Whole Milk Powder*, Cocoa Butter*, Unsweetened Chocolate*, Soy Lecithin*), Brown Rice Syrup*, Cane Sugar*, Invert Cane Syrup*, Palm Kernel Oil*, Acacia Gum*, Fair Trade Cocoa*, Sunflower Oil*, Sea Salt, Flavor*, Molasses*, Tapioca Starch*, Soy Lecithin*. *Organic.